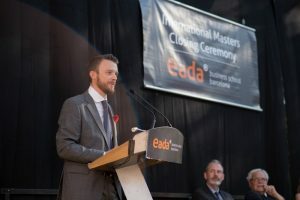 Ranked 1st in Spain and 6th in the world by Eduniversal, the International Masters in Tourism and Hospitality Management at Eada Business School prepares its participants to deliver excellence in Management, Leadership and Customer Orientation in their future careers. This is possible, thanks to a variety of reasons and one of the main ones is the experienced faculty involved on the programme. Approximately 75% of the faculty are professionals from the industry who are currently managing hotels, consultancies, or departments in travel distribution companies for example. Antonio Bignone, General Manager for The Serras in Barcelona leads the “Quality & Leadership” module, where he shares his recommendations and best practices that have allowed the boutique hotel he manages to receive multiple awards such as the World’s Best City Hotel 2017, Tripadvisor Awards: Best Luxury Hotel of the Year. N’1 in Spain – N’2 in Europe – N’4 in the World, and World Boutique Hotel 2017. Anna-Carin Nordin, experienced entrepreneur, keynote speaker and author leads the “Entrepreneurship in the Hospitality Industry” module, where participants discover the key skills and mind-set to set up their own company in the sector. The list continues, with expert collaborators from Hilton, Almanac, Christie & Co, Fira Barcelona, and IHG for example. All these professionals share a passion for driving Excellency in their organisations and a vocation for sharing it with others. This is why participants who complete this programme – who have shared a significant number of hours with these “mentors” – truly understand the links between leadership, quality and satisfaction, and learn how to influence teams to deliver accordingly to provide the best customer experience. The International Masters in Tourism and Hospitality Management, with its learning-by-doing approach, case studies, role plays, business simulations, projects, outdoor training activities, corporate visits to top companies and practical work experience provides an optimal balance between theory and practise, business and leadership skills development, enabling future participants to develop into effective managers at a fast pace. James Haigh holds a BA (Hons) International Business with Spanish from the University of Plymouth (UK), a Master in Direct & Digital Marketing and a Postgraduate Degree in Personal & Executive Coaching, both by the idEC–Universitat Pompeu Fabra (UPF). He is licensed Master Practitioner of Neuro-Linguistic Programming, Society of NLP. Specialization Program: The Neuroscience of Management Development by WIO-EADA. James has worked as an export manager, has developed business for a tech startup and now works as a consultant and trainer. Professional Certified Coach by AECOP-EMCC. James is currently a partner and project manager in Focus Inside, a consulting firm specialised in coaching, training and HR consulting.